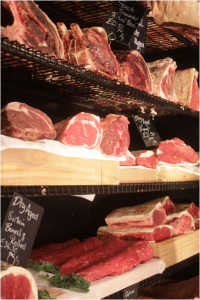 The end user for this project was a long established high end butchers business operating from a highly specified High Street outlet in a prosperous part of West London. 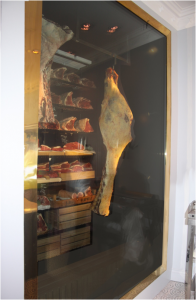 The end-user wanted a glass fronted coldroom in which to mature their various cuts of meat. 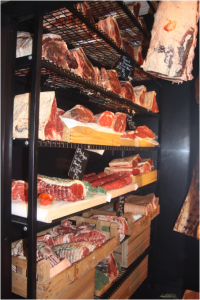 With a glass front to overlook the shop, the coldroom and the meat would become an eye-catching feature of their premises. A review of the market left our end-user with a dilemma. Standard cold room shelving, Nylon Coated/ Aluminium or Stainless Steel didn’t suit their intended ambience. They asked Craven to become involved in the project because of their capability to design and manufacture bespoke storage solutions. Manufactured in the UK, Craven products are entirely appropriate to provide top quality local produce. Based on the specification provided by the end-user Craven’s Design and Account Management team settled on a 3m high six tier shelving bay to make the display both eye-catching, easily viewed and large enough to showcase their wide range of cuts of meat. Made of mild steel and finished in a matt black paint, the shelving co-ordinated the rest of the shop interior and extended the quality feel to the premises. It also complied with food hygiene regulations and the ambient temperature of the cold room environment. The images below show that the fully dressed finished product was certainly an eye-catching feature of the shop.